Hamlet (German: Hamlet, Prinz von Dänemark, lit. 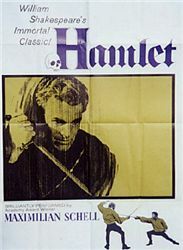 'Hamlet, Prince of Denmark') is a 1961 German mystery drama film directed by Franz Peter Wirth. The screenplay by Wirth is adapted from the William Shakespeare tragedy of the same name. The film was initially broadcast on television on 1 January 1961 in West Germany before being released theatrically in the United States in 1962. Prince Hamlet of Denmark returns home to find his father murdered and his mother remarrying the murderer, his uncle. Bill Gibron, writing for DVD Verdict, said that "In the literary life, you either love Shakespeare or you don't, and the Germans definitely do not. This 1960 television version of the Bard's brainchild is so cold and calculated it's like Berlin in February." FlickFilosopher wrote that "this is a take on Hamlet that could otherwise be construed as cruel and unusual punishment." Kevin Murphy wrote, "Leave it to Germany to turn a bleak brooding play into an even bleaker, broodinger movie-of-the-week for German television. This thing, made in the early '60s, has "we're still really sorry for the war and feel terrible" all over it." Hamlet was dubbed into English under the supervision of Edward Dmytryk. Schell provided his own voice: among the other actors used for the dub were Ricardo Montalbán (Claudius) and John Banner (Polonius). This dub was later featured in a season 10 episode of Mystery Science Theater 3000.